Imagine choosing to play the lottery online and winning the biggest jackpot possible. What are the possibilities with this sort of cash? A new house, perhaps? A chauffeur-driven car to take you anywhere that you want to go? When players dream about how to spend a lottery jackpot, fabulous vacations and houses always spring to mind first and foremost, but one thing that should appear on any player bucket list is taking a tour on the Khalilah Superyacht. The Khalilah Superyacht is the jewel of the ocean, the star attraction that draws the eye of even the laxest boat enthusiast. The gold, pearlescent finish and black radar arch make the Khalilah take the breath away of any passenger that boards her. 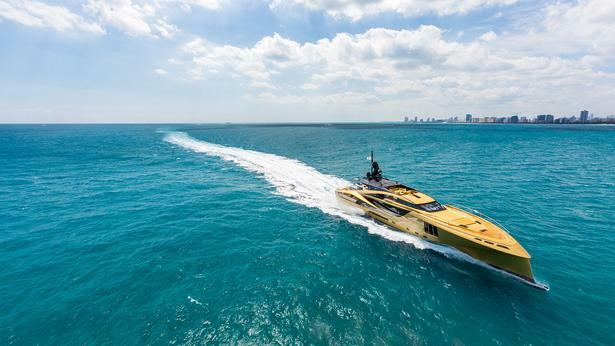 The fact she is gold is not what sets the Khalilah apart from the rest of the large yachts on the water, and it's not the fact that she is the biggest private superyacht built in carbon composite. 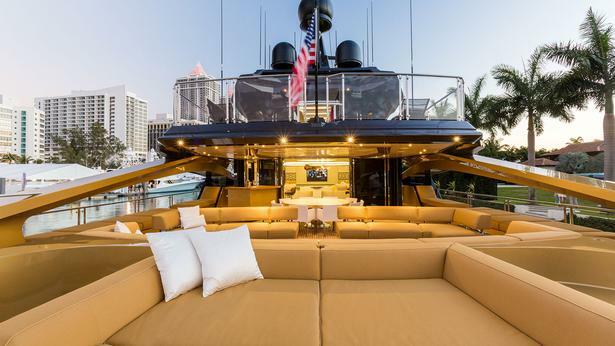 It's the aft deck, formed by its 11-meter beam. "The Khalilah has a beam of a 70 meter," states the owner, Timur Mohamed. The innovation that has gone into the new SuperSport series of yachts has been incredible, and the Khalilah has been in the works for almost a decade. It's a yacht without compromise, ticking the boxes of what all superyacht owners want. Clear, bold intentions have created the Khalilah in all her beauty, and she does not compromise speed, grace, efficiency or space. A Soupcon Of Palmer Johnson Genes. The Khalilah is sleek and sporty, despite her wide body aft. There is a long foredeck that ends in a slinky reverse bow. Above the deck, no winches or mast are cluttering the foredeck, and no towering superstructure - Palmer Johnson changed that years ago. It's all about aesthetic with the Khalilah, and the wave piercing element is beneath the surface of the water, allowing the superyacht to part the waves seamlessly. From the waterline to the top of the mast, Khalilah is 16 meters tall, with the aft main deck sitting on top of the broadest part of the hull. Looking from the inside of this marvel, the storage space is expanded significantly, with twin garages - one holding a fuelling station - holding a seven-meter tender and three jet skis There's also a large beach club, protected from the elements by a full glass door. 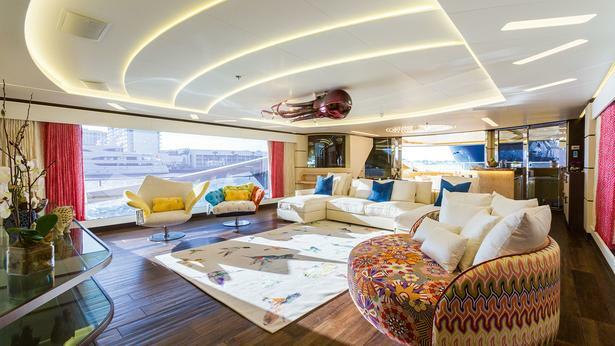 The aft deck size is 110 square meters, and there is the heavy use of glass opening up views wherever you look. Players who indulge their winnings can sprawl out on the large outside banquette, the large sunpads or lull against the shapely railings around the edge and enjoy the views. The interior is simple, playful and functional, with LED lights spiralling over the entrance foyer, a glass octopus for style and low lying seating on top of parquet flooring. The tone is luxury and beauty - and the Khalilah does it in spades. Ready to experience the Khalilah Superyacht for yourself? Play the lottery online today and you could be a millionaire sooner than you think.